Genuine Witchcraft is Explained by John of Monmouth is an important book, particularly in the power of being a historical document and a celebration of legacy. It is truly an important publication that allows the reader a travel in time that allows us to witness the dynamics in a working group of the mysteries. As a historical document it is also volatile for the discrepancy that lies at root of history as a discipline; notably that history is largely qualified guesswork upon facts occurring across a horizontal axis of events. History has never intended to be anything more than this. All historians will have a point of departure that serves as their focus, the red thread as it were. For John of Monmouth the focus is Ron White and his legacy – as such the book is a tribute to this man and the impact he held on the revival of paganism and witchcraft – and it is perhaps here the book can be experienced as a bit diffuse as it sets out to explain witchcraft, but is in reality paganism explained. Now, this might sound like hair splitting semantics, but I do hold, as Robert Cochrane did that ‘a witch might be a pagan, but a pagan is not necessarily a witch’ – there is a distinction here and it is my informed opinion that the ‘witchcraft’ was something Robert Cochrane kept away from the Thames Valley Coven as it was a matter for his other group, The People of Goda or the Clan of Tubal Cain. The distinction between clan and coven is in all available communication we have from Cochrane kept apart. And it is here written in the documents and letters included as appendices, that The Clan of Tubal Cain existed before Robert Cochrane’s death. Certainly after he met Evan John Jones, things shifted significantly. Others including Norman Gills and William Gray served as energetic and inspirational additions to The Clan of Tubal Cain – hence Cochrane and his Clan became from 1963 more salient as a disparate entity from the coven. So, basically, the Royal Windsor Coven that was established as an inner circle after Cochrane’s death held no bearing on Cochrane’s legacy and transmission in the form of The Clan of Tubal Cain. It is known that Roy Bowers stated several times, prior to the foundation of Thames Valley Coven that he already possessed initiation by virtue of at least three sources in Westmoreland and Long Compton. A subjective perspective makes John of Monmouth discard Roy’s claims (but those of us who have been subject for the transmission of blood knows that such matters are not written in ink – but with starry quills on parchments of blood)– even though these various lineages informed his smaller group of the nameless art that he referred to as The Clan of Tubal Cain, The People of Goda. The book also holds personal value for me as it speaks of the involvement of one of my spiritual ancestors, Robert Cochrane and his involvement in the Thames Valley Coven that later gave birth to The Regency. But it should be noted that for John of Monmouth, Cochrane is not the focus of his interest, not important per se, except only as a part of his legacy - just as he stated when he was interviewed at ‘Witchtalk’ He also said in the mentioned interview that he is more occupied with the paganism of man. John of Monmouth explains in the preface that he considers himself as pagan and "not of the Craft", he also states that what he is writing about “is not witchcraft as most people would recognize it”, and it is exactly here the great divide lies. This book clearly describes and explains that ‘paganism' very much evident in the inclusion of Ron White’s The New Pagans’ Handbook. As such, this book honors in beautiful and great ways the legacy of John of Monmouth’s mentors – which is indeed both honorable and worthy! Cochrane did entertain the pagan gatherings of Thames Valley Coven but these were not pursuing witchcraft, but pagan constructs that focused on celebrations of the yearly cycle in carefully chosen locations such as woodlands and groves. Cochrane might well have just been happy to find people he could work with, no matter their persuasion. 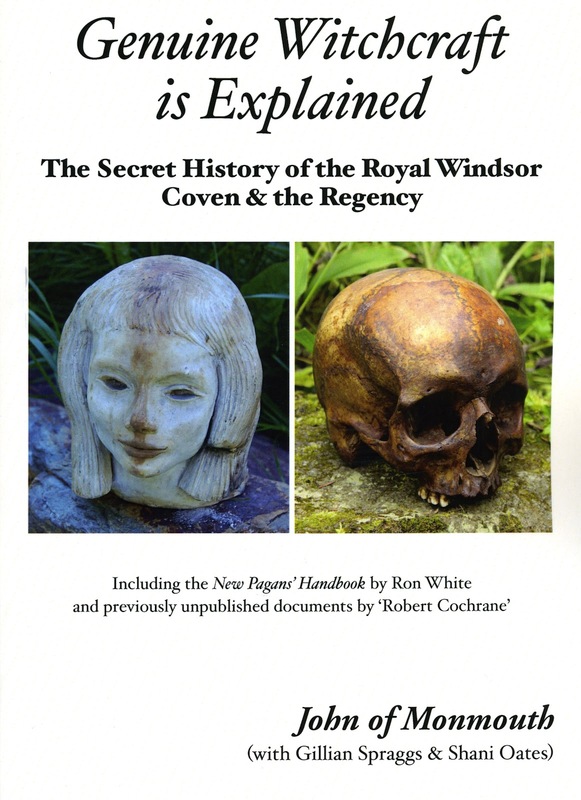 A common reference for all those involved in the Coven was Graves' the White Goddess and it is evident in the material presented that themes from within that book were important for Cochrane and his Clan and also the Thames Valley Coven that was part of it. “What is the connection between the Regency and the ‘Cochrane Coven’ (the ‘Clan of Tubal Cain’ prior to 1967)? The answer is simple. The Regency was an evolution of the ‘Cochrane Coven’. Not only was the Regency founded by members of the coven and most of the members were, at least initially, members of the Regency, but the organization, rites and beliefs of the Regency originated in the coven. Robert Cochrane came to the Coven already a ‘man of od’, ‘as the devil of the People of Goda’, ‘a Pellar’ – so it is highly inaccurate to state that the Thames Valley Coven and The Regency ‘gave rise to the Clan of Tubal Cain’. In fact these were quite distinct and separate groups both in focus and style. As we see stated in Shani Oates’ chapter within the book: “Bowers (Cochrane) declared ‘I am master of a small clan, the devil in fact’ (Genuine Witchcraft is Explained, p. 147). John of Monmouth states that the word clan first entered Roy’s vocabulary in 1964, Robert Cochrane had wanted to get in touch with other people of like mind, as his announcement in Pentagram demonstrates – but he was also careful with people and was restrictive and secretive with much of his activities. Naturally a mutual inspiration and influence occurred around that time , affecting the Coven profoundly. But from that obvious fact, it cannot be assumed or concluded that the Clan of Tubal Cain grew out from the coven. The book further suggests that it was Ron White and George Stannard that informed or empowered the Clan of Tubal Cain rather than Cochrane’s own legacies as stated earlier. John of Monmouth explains in the preface how this book is Ron and Georges’ story, albeit penned by himself. And I therefore feel it is important to keep in mind that the book meticulously strives to uphold this perspective. This book is actually the story of The Regency as a group and not so much a critical study about Cochrane and his claims. So this is perhaps one possible way of understanding Cochrane’s involvement – even so, we, The Clan of Tubal Cain do not ascribe to this understanding of the Clan’s origin. From the material found in this book, including the correspondence, it is evident that the communications provided are not as straight forward as the author sees them. It is perfectly possible to read the many letters and documents included in the book concerning Robert Cochrane as valuable material to the group. It is possible to interpret that Ron and George felt intimidated by Cochrane at times and it is also possible to conclude that Cochrane himself felt this group was on a wholly different level altogether compared to his other group, The People of Goda. This detail of grave importance aside, John of Monmouth has presented a document of a group’s development over time that is fascinating, stimulating – and important, an honest tribute to Ron White and a tribute to his legacy. That legacy is no more and no less – the Regency! With this I will congratulate John of Monmouth on a truly wonderful work. May he live well and prosper!